Lionel Messi has broken the all-time Champions League goalscoring record with a hat-trick against APOEL Nicosia on Tuesday - his 72nd, 73rd and 74th of the competition. The Barcelona forward drew level with Raul with a brace against Ajax at the start of November, but his treble against APOEL takes him away from the rest of the pack. Speaking after the match, Messi said: 'I am very happy to break the record in such an important competition but this was a big game for us all records aside. 'We want to compete in every competition and we needed the points tonight. Messi has been the Catalans' star man for much of the last decade, and at 27, still has many years of Champions League football in him. 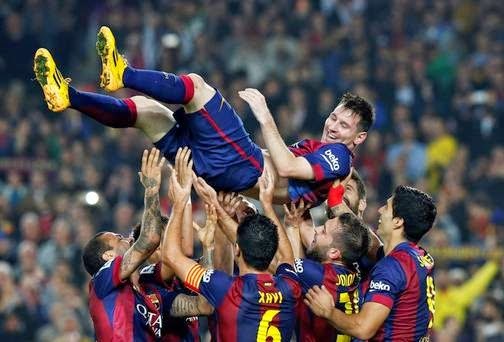 Messi's record tally in Europe's elite club competition is the latest milestone in his stellar career after he broke the six decades-old La Liga scoring record with a hat-trick in Barca's 5-1 victory at home to Sevilla on Saturday. Cristiano Ronaldo is now third in the list with 70 strikes, hot on the heels of his La Liga rival.